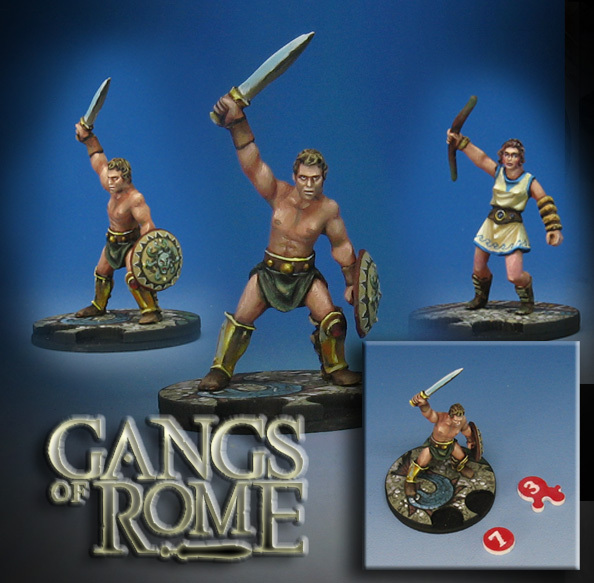 Here's another round of gladiators from Gangs of Rome. Just as I did with the mobs, I painted the mosaic tile patterns onto the bases. In that case of this guy, I matched the design from one of those larger multibases, so they would appear as if they were walking on the same floor. These are the original bases, with the little cut outs for the wound counters and the identification numbers. I had a bit of fun with the shield design, playing the colors off the blueish grays of the mosaic tile floor.